JOHNSTOWN, Ohio -- Andy Joseph didn't seek the marijuana industry -- it found him. 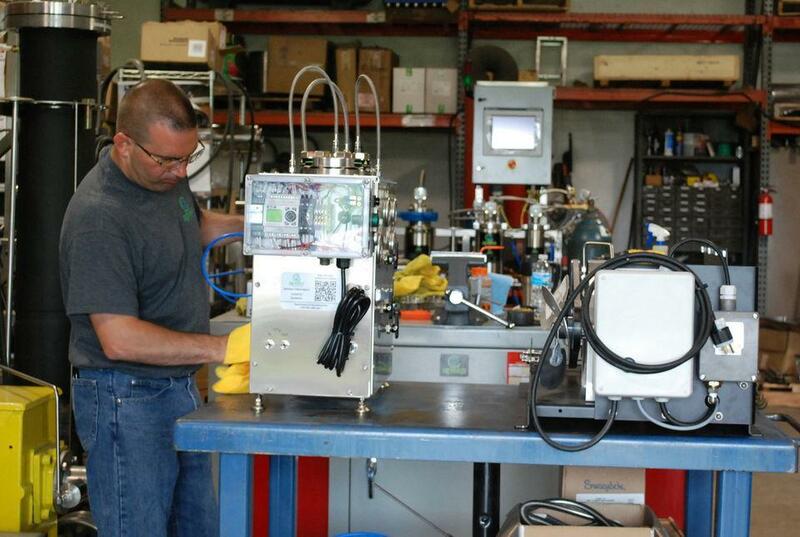 The Navy veteran and father of five began building botanical oil extraction systems from his home northeast of Columbus while working as an engineering director for a manufacturing company. The systems were made to extract essential oils and natural flavorings from plants such as lavender, spearmint and peppers. But entrepreneurs in California found another use for Joseph's machines -- extracting chemicals from marijuana that could be used in hundreds of products. Joseph's business grew as more states legalized marijuana, leading him to quit his job in 2012 to run Apeks Supercritical out of a 2,000-square-foot pole barn in his backyard. Sales reached $9 million last year, and 95 percent were for cannabis extraction in other states. The plant is still illegal nationally and in the Buckeye State, but that could change as early as this year. Political action committee ResponsibleOhio plans to propose a constitutional amendment on the November ballot that would legalize marijuana for personal and medical use for adults over age 21. Its plan limits commercial growing to 10 pre-selected sites promised to campaign backers but allows Ohioans to manufacture cannabis candies and other products and sell marijuana in retail stores and medical dispensaries. That could prove fruitful for hundreds of business owners like Joseph, who never touch a plant but sell an ancillary product or service. Several of them have already forged successful businesses in the legal marijuana industry, and their experiences offer a glimpse of what Ohio legalization could mean for future pot-preneurs. Twenty-three states and the District of Columbia have medical marijuana programs and four states -- Colorado, Washington, Oregon and Alaska -- have legalized personal marijuana use. ResponsibleOhio's proposed constitutional amendment could make Ohio the fifth state. Big corporations have been unwilling to take the risk of investing in a federally illegal drug, so entrepreneurs and small businesses have stepped in. Garrett Fortune founded OdorNo, which makes odor-blocking plastic bags marketed for picking up pet waste, hospital trashcans and other pedestrian uses. In 2014, Fortune pitched the idea of selling the odor-blocking plastic to the marijuana industry to the Cleveland company's board. One year later, Fortune's new company FunkSac is the leading provider for cannabis packaging. Every sale in a Colorado pot shop has to leave the store in a special child-resistant plastic bag that meets state regulations -- FunkSac makes those. The company also makes bags used to transport cannabis from growing facilities and for edible cannabis products. Fortune said he had to travel to where his customers were -- to get dinner with them in addition to learning about their business. "This is a small industry and everybody knows everyone," Fortune said. "It's still in that early infantile stage. Being able to network and share resources is essential." iGrow, which manufactures induction lights used to grow tomatoes, cucumbers and other plants, began in 2009 at the Beachwood business incubator. While trying to test the technology and build a reputation, founders Eric and Cary Senders and Ari Seaman turned to marijuana growers to vet its lights. "These are some of the best growers in the world," Senders said. "Marijuana is not an easy plant to grow and the main tool in the business is light." The lights, which last longer and give off less heat than others, were a hit. Because they can't test the lights on marijuana in Ohio, Senders said, iGrow relies on growers to spread the word. Their medium of choice: Instagram, the photo-sharing smartphone app. "We rely on that market to talk to itself," Senders said. "Because the light is becoming so popular, growers are talking about it. They love to talk the culture." Joseph said people told him he could sell 10 times as many extraction systems if he were out west. He chose to stay in Ohio, where his kids go to school and where he can help grow the economy. The systems are completely designed and built in the barn and cost between $35,000 and $180,000 apiece. Apeks plans to open a new 17,000-square-foot facility here in July and hire 15 more people, and there's room to expand to 65,000 square feet as business grows. He's hired graduates from CTEC, Licking County's vocational school. "I wanted to give back to the community, support the community, grow jobs," Joseph said. "I decided to go the longer and more expensive route of building a facility in Johnstown. It was important for me to stay here." Apeks also plans to build an extraction facility to use its equipment for small producers such as a local lavender farm. The facility would be ready to extract hash oil if and when Ohio legalizes marijuana. Patrick McManamon, CEO of Westlake-based Cannasure Insurance, said his company employs a handful of 20-somethings that moved back to Cleveland from Chicago and other larger cities. The company provides insurance to marijuana cultivation facilities, marijuana product manufacturers and dispensaries. "It's a point of pride for us that we have these young, aggressive people working for us in well-paying jobs," McManamon said. But McManamon and the other Ohio businesses have hired employees in legal states. McManamon said he's met many industry entrepreneurs who have Ohio roots but left the state. "You'd be shocked how many people in this industry are from Ohio," McManamon said. "Thirty to 40 percent of the people I meet at industry shows are originally from Ohio." Federal prohibition makes banking almost impossible, leaving most marijuana businesses awash in cash. Ohio's ancillary businesses don't actually touch marijuana, but banks still refuse to serve them. Joseph said he couldn't find a local bank to finance a loan for his new $2 million manufacturing facility, eventually getting approval from PNC. However, PNC shut down accounts for Cannasure and McManamon's family, which had held accounts with the bank since 1946. McManamon was banking with an Oregon bank but last month learned his accounts were being dropped again. It took 40 days to find a new bank he could trust. "There's too much money we get and that we have to send out that we cannot afford to have some company we don't know walk away with our money," McManamon said. FunkSac's Fortune said the aversion to cash from "cannabusinesses" has led some clients to store their cash, which often shares a safe with marijuana products, in his odor-proof bags so it doesn't smell like dried marijuana. And the newness of many of these businesses makes the industry volatile, said Tom Vezdos, vice president of the commercial division for Rough Brothers, Inc. The Cincinnati-based company has been building commercial greenhouses for 80 years, but recently began receiving requests to build marijuana growing facilities. Vezdos said their clients who grow marijuana are often new to operating a business. "You have a large amount of money and large amount of investment and the people growing are not always familiar with operating a business," Vezdos said. "Everybody had to do their growing secretly in their basements over the past few decades, so there's a lot of learning going on." But the risk-takers can be rewarded with riches. Apeks is on track for $15 million in sales this year. Cannasure clients are paying six-figure insurance premiums. iGrow landed a contract with the University of Mississippi to provide lighting for its pot farm, the only facility sanctioned by the federal government to grow cannabis for research. Joseph warns would-be pot-preneurs from thinking they'll get rich easily. "It requires just as much business aptitude," Joseph said. "It's not just bunch of stoners anymore. It's a very competitive landscape and competitive with small companies. It's a once-in-a lifetime opportunity for entrepreneurs."